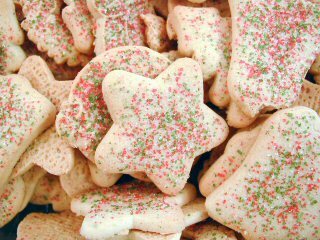 I admit to a rather juvenile (and unhealthy) liking for big, thick, soft sugar cookies, along with all the other sights and smells and tastes… and especially sounds of the Christmas season. I love the jingle of bells; the sound of my husband’s voice reading from Dickens; the knock on the door immediately followed by the voices of carolers. The first time our organist plays “The First Noel” or “Joy to the World” for prelude it can bring me to tears. The hymns and carols of Christmas are among the most beautiful music on earth, so I feel almost presumptuous adding to them. But Christmas sets the world a-singing, and I’m no exception. This simple song, my 2006 Christmas Card Carol, is my humble contribution to the sounds of the season. Note: This carol is offered in several keys and voicings, but not specifically as a high-voice solo. If you’re looking for a higher version for solo voice, just use the SSAA accompaniment. Thank you so much for your lovely music.I always find something from your collection everytime I have to perform.And now am searching for a Christmas solo. I’m wondering if there might be another verse available? Just thought I’d ask. I really like that this song is not high. It is lovely. I’m interested in this as well!!! I love using your music. I want to use When the Son of God Was Born SAB for our Christmas program, but I also want to use the violin part. Since it’s only written for the AB arrangement (in another key) I was wondering if I could have your permission to transpose it and use it with my choir. Or–maybe it’s somewhere on the website and I just can’t find it! Thank you, your work makes my life so much better. Realmente es de bendición y mucha utilidad lo que hacen. Me encantaría aún más si se hicieran más grabaciones SABT papa conjuntos mixtos. Yo tengo uno. please make some more..solo for male…i really love your music. it touches my heart that sometimes make me cry and reflect..
Do you know what Key the recordings are done in? I am looking for sheet music for When The Son Of God Was Born with guitar chords. Do you know where I could buy that? I need the Mezzo/Tenor key. Thank You! And thank you for all of your beautiful music! I sang Would I Know My Savior with a string quartet last year and Loved it! My ward choir is performing this in Sacrament meeting before Christmas. Everyone in the choir loves this. Some of the altos expressed how they love the lullaby feeling of the music. Can’t wait to share it with the congregation! Thank you again for all that you have done in giving us such beautiful music. This is a wonderful contribution to the carols of Christmas. My daughters and grand daughters have performed this song for the past several Christmas Programs. One of my daughters and I will perform it as part of my sacrament talk in December. It is absolutely a beautiful piece of music! Thanks for sharing your gifts. Thank you Sally!! Once again, your generosity of your beautiful gift will touch hearts and lift spirits in our ward this coming Christmas. You are my hero!! My daughters and grand daughter will be singing this song as part of my talk in sacrament meeting this Sunday. I’ve chosen this song and 2 others to perform at the Portland’s visitors center December 7th, I wish you were here.